The well-equipped gym offers ideal platform for daily workout. 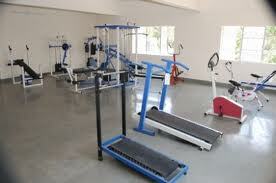 Our Hi-tech gym is located in our hostel campus. Gym is a complete fitness centre that provides facilities for Fitness, Weight Reduction, Weight Training, and Executive Fitness Programme. A well trained fitness instructor provides fitness training to all students and associates.